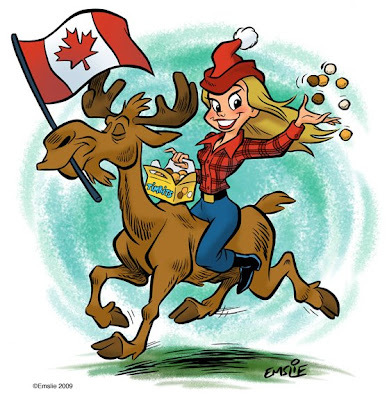 The Cartoon Cave: Happy Canada Day!! Oh like dats a beauty sketch you did there eh? I was sittin here in Ireland enjoying some back bacon and knockin back a few brewskies to celebrate the 142 today. Actually I was working and my fellow Canadian co worker pointed out to me to have a happy Canada day and the rest of the studio was like, Canada day? is that today? ?...what's Canada Day? We even ended up trying to answer what does Canada mean? and we both referenced the Nation Historical commercials where the European's meet up with the Natives. Have a beauty day, eh. you know how they named Canada? All the letters were mixed up in a hat, and an official drew out, "C, eh? N eh? D, eh?" Pete do you think to start up a petition to swap Captain Canada with this fine looken lady? As for your post on Canada not really making a name for itself anymore; do you think the cause of this could have to do with the provinces being too busy competing with each other rather then working together? Being a Newfoundlander even in my soon to be 25 years on this planet, I've seen my fair share of other provinces taking advantage of our natural resources and leaving us with mere dog scraps. Hey Chris, good to see you on here! Yes, I think that's certainly part of it - the fact that the provinces all seem to be rather selfish in their desires. One thing that's always been particularly galling to me is, not only do we have the Parti Quebecois within Quebec fighting for separation from Canada (which I can understand in principle, even though I don't agree with them), but we also have allowed their national counterpart, the Bloc Quebecois to be recognized as a legitimate party within Parliament. That to me is just absurd! The fact that the BQ only runs candidates within Quebec should disallow them as a federal party. After all, even if they won every one of their ridings in a federal election, they would not have nearly enough seats to form the government of Canada, and of course that has never been their goal, so why do we take them seriously? It also bothers me that we occasionally hear rumblings of separatist desires in Alberta and BC. Again, it all boils down to selfishness on the part of these various provincial lobby groups and individuals, not helped by some provincial Premiers with delusions of entitlement. The provinces should be working together and looking out for each other's best interests as well as their own, all working towards a stronger, more united Canada. I'm not going to let Newfoundland completely off the hook either (so to speak) in regards to their over-reliance on the fishing industry. The cod stocks are depleted due to over-fishing and yet still Nfld hasn't come to terms with it and continues to turn a blind eye to the facts. They should have been developing alternative industries decades ago, so as not to become so reliant on just the natural resources. Mind you, I believe the federal government should be helping them to create more tech-based industries to wean them off of the fisheries. That would be money well spent. There's an awful lot that Canada has done wrong over the years. We've become too reliant on our natural resources, including oil, mining, forestry, etc. while at the same time allowing many of our national companies and institutions to be bought out by bigger foreign corporations, that we really don't have much left to be proud of. Yeah, I'm pissed about it all. Canada could have been so much more than it has become. Hey again Pete, with regards to NL and our now non existent fishery, yes, Newfoundland obviously took part in the depletion of cod n' such and as hard as they try to keep what is left alive, the biggest issue has to do with illegal fishing from foreign countries. Thus I'm not putting any blame on Canada for NL no longer having a fishing industry. The biggest issue when it comes to anything in the ocean, there isn't any laws, so even though we fully well know that such things like whales are on the decline, there's still people out there killing them and there's really not a whole lot anybody can do about it. Newfoundland's big thing right now though is oil.. lots and lots of oil, along with a huge amount of minerals that are being mined up in Labrador. So, technically we should be like Alberta and rolling in the dough, but with rotten deals and all the processing done elsewhere our profits have been very slim. Yes we still profit from jobs, but that's mere pennies when you look at the big picture. Although, our latest premiere Danny Williams has finally turned things around so we're making a nice dollar off of the most recent oil company to set up shop off our coast and we're finally smelting any ore from up in Labrador in Newfoundland. Apart from natural resources though, the tourist industry is a big thing for us too. Of course that's also been hurt due to Nova Scotia complaining about us getting to have an international airport. Soo.. after enough complaining we've lost our international airport and Nova Scotia now has one. Doesn't seem like that big of a deal but when you have a large number of Europeans that were flying into Newfoundland and building million dollar + homes on our west coast due to it's convenience and being right by a ski resort, it makes a hell of a difference for Newfoundlanders. (we were making such a profit off of this not even American's were able to build homes on the west coast.. Europeans only) Sure Nova Scotia doesn't seem that out of the way, but when you land in Nova Scotia, fly to Toronto, and THEN Newfoundland, it's now completely out of the way. I'm honestly surprised that Newfoundland didn't end up becoming part of America since they set up all sorts of military bases and hospitals back in the days of WWII before Newfoundland was even part of Canada. All along our harbor there's still bunkers that they had set up along with a fort with a massive canon still sitting there waiting for some action. Poor guy never will though since it's in way too rough of shape to be firing off any shells. Anyways, again, Newfoundland after all these years have finally gotten themselves out of the gutter and things are looking pretty good our way. Every time I go back home there's always been a lot of major renovations going on in downtown too which is always great to see. But again, too much back stabbing and competition between the provinces. Although as you mentioned in your last paragraph with Canada being too reliant on natural resources, that's still how Newfoundland is prospering today. I guess another major problem for Canada making a name for itself in this day and age would have to do with everything being manufactured in places like Japan since it's so damn cheap. Quantity has clearly taken over on quality. Nobody is willing to spend money these days and for the most part it's hurting them in the long run. As you fully well know, it's pretty obvious in the animation business that quality has just gone down the drain which is really sad.. everything being digital doesn't help either, especially when it comes to any background paintings for animated shows; anyone who knows a thing or two about photoshop can get away with working in a studio as a background artist. Talent and time just don't exist anymore, and it's not helping Canada make a name for itself. As of recently I've actually been wondering what Canada would be like if were to just merge with America, they own enough of Canada as it is anyways.. Why not just become one massive nation and lose the border? That's right! Canada breeds the best looking women! PS to Chris: I would like to state that Cape Breton is constantly being screwed over by "Nova Scotia". As well, CB has been mined out foreign companies who have never given us a red cent!! It's the way of the east coast. Geez, this blog is lousy with maritimers!! :) Hey Mitch! Chris, you make some very good points there. I agree that the cod stocks have also been depleted by all of the international trawlers who don't give a damn about what they're doing, not only to the fish population but the damage to the ocean floor itself. It is indeed a crazy world. As much as I love the U.S. and the opportunity it offers, I must confess that I'd hate to see Canada annexed and becoming a bunch of new states. Remember, I lived for 4 years down in Florida, so I came back with a new perspective and basic appreciation of what we have here. We have our problems, true, but there's still a lot of things that I believe Canada does better, our relatively less broken economy being one example, due to our fiscal prudence and maintaining stricter credit regulations. Also, I love the fact that here in Canada religion is a personal issue, and that we don't elect our federal leaders with one of the criteria being which one has the greater faith! Sorry to my American readers, but that nonsense has always grated on my nerves. A candidate's religious beliefs, or lack thereof, should never enter into an election. Canadian elections are always fought on real issues alone. On the comment of Canadian women, I do tend to notice whenever shopping in Toronto that the women tend to have larger firmer breasts than those south of the border. Some sort of gravitational thing, I wonder? Just so happens that I'm down here in the states for my co-op in Colorado; and ya America has some issues for sure so I'd easily choose to live in Canada over America any day. The point you made about American's choosing their leaders based on their religious faith has always blown my mind. Really can't grasp that concept for the life of me. Supposedly John McCain's lesbian daughter has recently convinced him to change his views on gay marriage, although I highly doubt he's actually changed his views for a second. Their health insurance is really messed up too; they mentioned on the radio that there's health insurance companies out there that will gladly insure you when you don't need them, but when you start falling apart they'll abandon you and you're on your own. Of course then, if you're abandoned and now uninsured with medical bills up the yazoo, good luck finding anyone who's going to insure you. Pretty pathetic way to run things if you ask me. They have some really messed up deals going on too with vehicles where companies such as Ford and Kia will lease you any of their vehicles and if you lose your job then you can just give it back to whomever you were leasing the vehicle from without your interest rates going up, nor do you have to pay them any return fees. Sooo I guess it's safe to say that American's still haven't learned to save their money; if you're purchasing a vehicle and know your current job may be in jeopardy, best bet is to save the money you are making and hold off on any new vehicles till things are looking more prosperous. On a similar note, the traffic system they have for the highways here is pretty neat. (at least in Colorado, I don't know if applies to all the other states) During certain hours of the day the on ramps have a red/green light that will activate, so when it flashes green for not even a second, two cars set forth onto the highway at once, and then it turns red for about 5 seconds and again, flashes green and two more vehicles get to merge onto the highway. At first I thought it was so idiotic, but then it clicked and I realized that it helps keep the highway from being congested by too many people merging onto the highway at once. to build better and stronger provinces, they must realize that they cant be like Ontario and that they must get over it and sort out whatever little problems they have going on in whatever those other provinces are. Id be specific but we all know it doesn't really matter. Walter Cronkite Signs Off For The Last Time.